There is a saying that a person attracts their fears. I never fully understood this phrase until my guiding days when numerous incidents indicted the truth of the saying. I have experienced a number of others where people seem to attract their fears. Another memorable case occurred at Lobengula Lodge in the Shamwari Game Reserve. The lodge lies in a valley and is surrounded by bush - and is a haven for snakes such as Puff-adders and Cobras. In the summer months snakes were regular visitors to the lodge grounds but they never affected the guests, until the day a British lady arrived and promptly announced that she did not want to see a scorpion or a snake and that we must make sure that her wishes are respected as she had a serious phobia about both.All seemed to go well - for the first hour after her arrival - until the phone in the office rang and a hysterical voice announced that there was a scorpion in the room. In fact there were two. Thinking she may have seen a fish moth or other limbed insect I headed off to the room.In the year that I had been at the lodge at the time I had never seen a scorpion in the lodge grounds, let alone in one of the rooms. 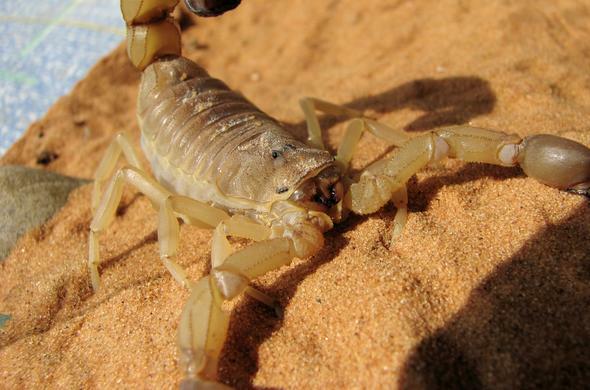 In fact one of the rangers, who was in the office at the time, muttered under his breath that there was no way it was a scorpion as he had never seen one in the reserve at all.Confident that I would calm her down and prove that it was a harmless insect, I knocked on the door. After a squeaky reply I entered the room and saw the lady pointing to the center table. I casually looked under the table and almost recoiled back into the guide who was about to look under the table. There was not one scorpion under the table, but three.After a great deal of explaining to her about how unusual it was, she moved to another room. As i was walking away after dropping her luggage off in the new room I heard her comment: 'Just make sure there are no snakes around here okay'. Sometime later, and still smarting over the scorpion incident, I heard a loud scream echoing through the valley. I ran to the room where the lady was in, hoping that there was not another scorpion in her room. When I got to her door I realised what had scared her. The resident Cape Cobra was crawling into the drain pipe about a meter from her door. 'Okay no more jokes', I heard her say. I looked at her and without missing a beat I said: 'Okay no more jokes. I will tell the staff member who has been doing this to stop. In fact I will put him on probation until you leave'. 'Just where do you get such realistic toys', she asked.